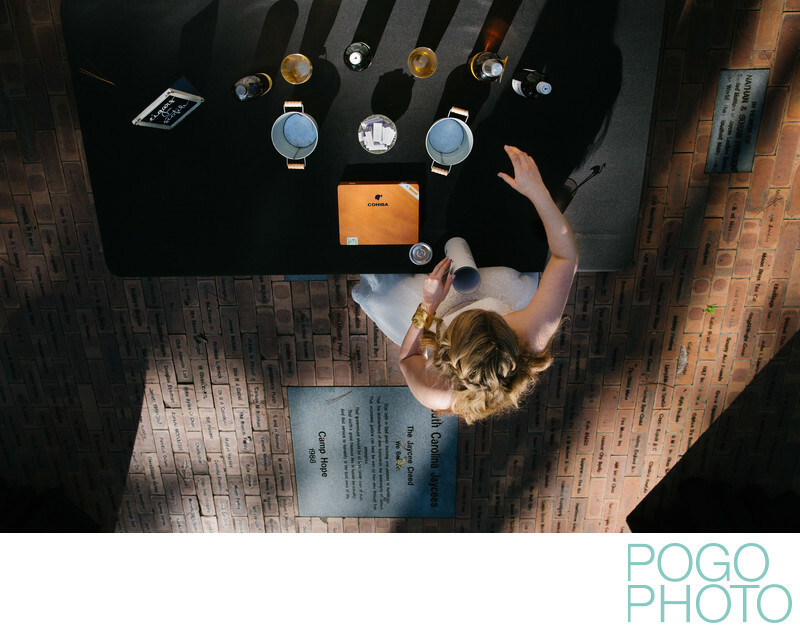 We love this image of a bride as she observes some of her drinks and details, captured from a unique perspective during a destination wedding in Clemson, South Carolina. While this wedding was a destination for us, it was more of a homecoming for the bride and her extended family, many of whom grew up in this beautiful corner of South Carolina. Clemson is home to the university bearing its name, and the purple and orange colors of the school are present throughout the town. The school’s mascot, the Tiger, is the inspiration for a statue on the school’s grounds and the orange paw prints painted on the surface of local streets, guiding those unfamiliar to the area around different parts of the campus. We photographed this wedding just a few months before Clemson’s football team won the National Championship game against the heavily favored Alabama Crimson Tide, an upset victory thrilling people nationwide and bringing many guests of this wedding to tears of joy. Many family members, including the bride’s parents, are alumni of the school and enjoy cheering for the football team as well as all the entire athletic program. Kresge Hall, part of the Clemson Outdoor Lab, was the primary location for the majority of the wedding day and proved to be a great venue, giving us lots of options from behind the lens. The waterfront location offered a great view of the nearby lake and rolling hills, both of which are synonymous with the Clemson area. The walk to the canoe launch leads guests down a tree covered path, which was an ideal spot for their first look. The gently sloping lawn between the lake and the hall itself hosted the ceremony, which provided both easy access for guests and beautiful natural light for the two of us. Kresge Hall is built into the slope of the hill and has access from both levels. The split level and the covered porch around the second floor allows us to use dramatic angles we to create images like this one. This image captures a relatively normal, casual, and candid moment as the bride tours the venue space before any guests arrived, perfecting the placement of details such as the cigars and liquor bottles seen here. What makes this image stand out so much is the creative use of angles and leading lines. The photo was taken from a position both overhead and slightly in front of the bride. From here, the word “Cohiba” was not easily readable, so we turned the camera upside-down to compensate. The result not only makes the words on the box legible, but creates a completely different feel to the entire image. The sun is now shining in from the bottom of the frame, casting shadows from nearby trees, the bottles, and the bride herself into the direction of the top right corner. When observed closely, the shapes of these shadows provide greater detail of certain objects than the simple overhead view shows. The bricks on the ground create leading lines out of the frame, but the effect here is more dramatic based on the camera angle. There is an almost dizzying feeling when your eye moves around, as though we are all about to fall into and out of the picture itself. The shadows cast by the nearby trees and other parts of the building originally appeared to framed the bride and her table when we were shooting from a normal position, but the simple inversion of the camera transformed these previously inane shadows into an open trap door. Location: Kresge Hall, 415 Charlie White Trail, Pendleton, SC 29670. 1/640; f/4.5; ISO 250; 26.0 mm.